Just put the turkey in to begin roasting, made the fresh cran-orange relish (that was a bit of a chore…) and now am taking a few ‘me’ minutes before ‘going at it’ again with the preparations. Wanted to take a few minutes to wish all of you a wonderful holiday, full of love, friendship, family and, of course, good food. Remember to give thanks for all you’re grateful for. Just a few minutes ago I placed a phone call to the lady who is in charge of collecting my completed afghans for The Ghana Project and holding them until THE person who thought up the project (Bettye Wright) gets back from Ghana. I then sent an email to Bettye in Ghana; she replied within minutes that she would love more afghans, is a bit short on them at the moment and will be coming here sometime soon. After responding to her email, I sent one to my other friend and missionary in Durban, S. Africa asking if he will be needing more afghans soon, as he will be returning for a short visit in January (haven’t heard from him yet). That got me to thinking: isn’t it AMAZING that I can sit here in the comfort of my home and correspond with people around the world from me? AND receive a response quickly? Yes, I’m aware I could have placed a long distance phone call and done the same thing, but actually, if you think of it…15-20 years ago that kind of immediate response via computers was not possible to the average person. That’s amazing to me! For that matter, I certainly wouldn’t have thought that I, in my little township in Michigan, would be communicating, much less even KNOWING anyone across the globe from me! My how life has changed; I’m 61 1/2 (gotta get that half in there…grin), imagine what technologies will be available to my children and grandchildren in the future. A wonder, for sure! ps: Just finished afghan #212; Bettye said she is in charge of 22 children (patients) at this time and could use the ones I’ve completed. (I currently have 27 completed afghans here at my house) I’m going to deliver 22 in the next week or so to the ‘holding lady’ at the hospital, then hold onto the remaining 5 for my friend’s visit in January. Wonder how many more I can get done between now and January? Along with the knitting line, I’ve been trying to adjust a ‘new to me’ pattern. 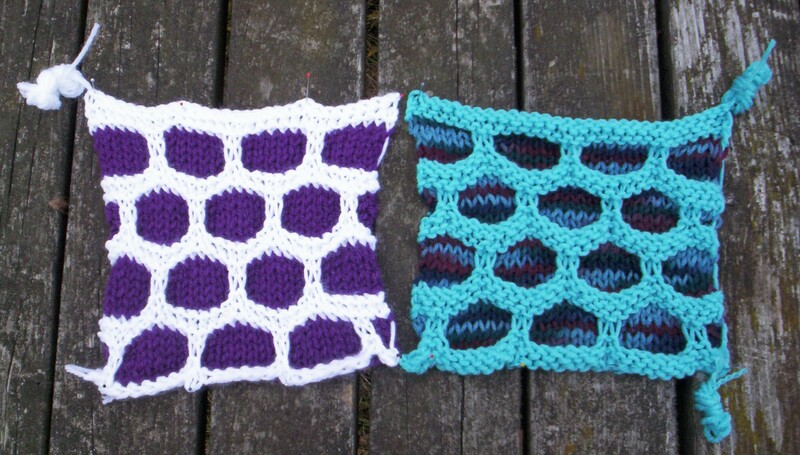 Below is a photo of the directions from Barbara Walker’s book: “Learn-to-Knit Afghan Book”, Hexagon pattern. In the below photo is her pattern; to the right is my adjusted pattern (I liked the ‘filling’ to be more bumped out). It’s another of the patterns that only require Knit, Purl, and slipped stitches; takes a bit to get the hang of it, but once you’ve done a few of the patterns it becomes easy. That’s what’s happening around here; hope you’re having a great day! 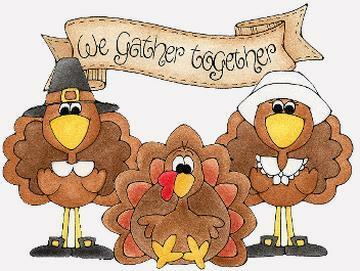 Now that it’s almost Turkey Day (and, YES, I now know it’s on Thursday, thanks to the reminder from my good friend Momma…grin) I guess I should explain my confusion on the actual ‘day’ of the holiday: in years past my son has been off for Thanksgiving holiday the day before Thanksgiving, but this year he has Weds-Sunday off, which threw my mental schedule off by one day. I think I’m finally ready with the food purchases. Made an early trip (again) to Kroger for a larger turkey; thought I had the turkey thing all wrapped up but now we’re having extra company and the 15 pounder just won’t cut it to include leftovers. Kroger is having a GREAT sale on Riverside turkeys 29 cents a pound with extra $10 purchase (using their Kroger card). I picked up a 20- something pound turkey for $6.01 … you just can’t beat that! Got a call last night to make a ‘fruit type dessert’ for a bride/groom shower our Sunday School class is throwing next Sunday evening after church. This is a very ‘interesting’ shower, as it’s for my long-time friend (the groom) who’s wife was my very close friend. You might remember a little over 2 years ago when I wrote about my friend dying of cancer…that was his wife. Sometimes in life (call it ‘fate’?) events fall into place that just seem ‘right’. In our Sunday School class is a lady (58) who is a widow with 2 daughters; her husband died of cancer 5 years ago. As ‘fate’ would have it, she and my good friend’s husband(he’s 63) have started dating and are now going to be married in January! They are both great Christian people, very devoted to their children and each other. For me, it’s been a bit of adjusting to get used to this new ‘couple’, but I’m very happy for the both of them-to see them together makes me think of the words: It’s like ‘coming home’…they belong together. I say all that to give you another recipe for a yummy dessert (don’t think I’ve posted this one before, but am not totally sure). It’s a light, fluffy, not too sweet dessert – every time I’ve made it there are NO leftovers…just plain great stuff! I usually double the recipe if it’s for a party. In a large bowl, fold Eagle Brand milk into Cool Whip until incorporated. Gently fold in pie filling and pineapple. Refrigerate 1-2 hours before serving. NOTE: You can substitute blueberry or strawberry pie filling and/or add chopped nuts before refrigerating. Even though I know it’s going to be a lot of work, I’m looking forward to the Thanksgiving meal; lots of good foods you don’t usually eat except at the holidays, friends and family to share with. With work schedules that day, we’ll be eating around 7/7:30 p.m. but that’s OK-part of the ‘downside’ of being in the food service business (oldest son is Executive Chef, his girlfriend is a server, his friend who’s coming is one of his employees…another ‘cook’). Sometimes I feel a little intimidated cooking for my oldest son because he’s a chef, but then I think again: “Hey, I’m sure he’s just glad that he doesn’t have to cook this meal himself!” Besides, sometimes he gives me little tips when helping with the last minute details (he’s a GREAT cooked potato masher!). This year I’m attempting to make homemade cranberry-orange relish since I can’t find Ocean Spray Cranberry-Orange relish (a staple EVERY year for our holidays…until THIS year!). His advice to me: freeze the fresh cranberries before grinding them…they come out less shredded that way. Then he added: “That’s the way I do it at my restaurant and I make that stuff all the time”. I still remember the young kid who was just starting Culinary training who decided to make dinner for us: spaghetti…and the entire kitchen filled with dirty pots & pans, spaghetti sauce EVERYWHERE! Ah yes…they DO grow up! Hope you’re ‘on track’ with your holiday preparations and food buying. It’s a semi-cloudy 49 degree day out today; still a nice Fall day (I hear we’re supposed to get the first “S word inserted here…Thursday or Friday…sigh. Not the ‘sticking’ kind, but s-n-o-w in any form just signals it’s coming in larger quantities very soon…the ‘downside’ of living in Michigan…sigh. Place half the cranberries and half the orange slices in food processor container. Process until mixture is evenly chopped. Transfer to a bowl. Repeat with remaining cranberries and orange slices. Stir in sugar. Store in refrigerator or freezer. Today was the beginning of ‘holiday food shopping’; I spent a good amount of time yesterday going through four different grocery store fliers and comparing who had the best prices on the various items needed for this coming Wednesday. Most of the stores ‘special prices’ go through 11/29, but our local Kroger only goes to this coming Monday, so it’s there I spent a bit of my time. Have you ever had one of those days where you just feel like you’re ‘out of sorts’? That was me in the store today; up one isle, down another – look at the list and realize that one of the things I needed was 2 isles back from where I was now…trek back and get it, then go on. This happened a good 4-5 times! (Must be getting senile or something! sigh…) Perhaps it might help to add that I was holding 2 lists: one was the regular weekly list and the other was the ‘specials’ I was supposed to pick up. At least I can say that I got a good ‘walk’ in at the store! Since Wednesday is Thanksgiving, I’m getting mentally prepared for the food preparations. We’re having the same menu we do every year (I know…some people like to ‘change it up’, but not my family): turkey, stuffing, mashed potatoes, sweet potatoes, gravy, green bean casserole, corn casserole, snow flake rolls (courtesy Kroger) and dessert. This year we’re having the Fruit Cheesecake Selection from Gordon Food Service: something like 12 slices of cheesecake/4 different fruit varieties, like Apple Caramel (only one I remember right now without going down to the basement freezer to check…sorry). One of my notes of ‘things to do’ today was look up the recipe (again) for Corn Casserole. This is one of those things I found on the ‘net a few years back and it’s become a ‘staple’ for our holiday dinners: nice texture, sweet but not too sweet, very creamy flavor…just a really good ‘side dish’. Preheat oven to 350º. Lightly grease a 9 X 9 inch baking dish. In a medium bowl, combine all ingredients, stirring to incorporate thoroughly. Spoon mixture into prepared dish and bake 45 minutes or until top is golden brown. I love this dish and usually double the recipe. The one thing I usually FORGET? To double the baking time…hence, it’s still not cooked when I think it should be (that happened last year…again….sigh). We’ll be having roast turkey; got a really good deal on one (13 lb.) and I usually (if we can afford it) try to get two at this time of year; one for the freezer. Turkey is such a versitile meat; great by itself, as well as in sandwiches, or the carcass makes great turkey soup. Knitting Update: After many attempts at getting the knitted cowl (neckwarmer) to lay right, I’ve given up on this project. It’s “o.k.” but definitely (in my opinion) NOT Christmas gift material: yes, it’s nicely knit and looks good…laying on a table, but NOT on your neck! Oh well, no harm done. Working on a new knit square pattern; will photo it soon and show you. It’s a very grey, gloomy day today; temps in the low 40’s and it’s drizzling occasionally…the kind of day you want to stay home, cover up with a nice afghan, get yourself a big mug of tea/coffee/hot chocolate and read a really good book. Me? I’m going to get off here, go make a cup of coffee, cover up and wait for my teenager to get home from school, which should be momentarily. Dinner is homemade (leftover) lasagna and garlic bread; no fuss there, it’s already made! Don’t ya just love leftovers night? Enjoy your day, hope you’re cosy! Today has been a day of realization that LIVING is expensive! (Yes, I heard you laughing!) For starters, let’s look at my insurance policy. We signed up for it many years ago and have been paying quarterly payments right along. About 5 months ago I noticed that we weren’t receiving my bill, only my husband’s, so I called the company. They explained that since my bill was much smaller than my husband’s (he being the major bread-winner and all) and more blah-blah-blah; I didn’t understand, but said: “OK” and let it go. NEVER DO THAT! NEVER say OK when you don’t understand something! Today I got a bill for my insurance premium, for $974.00!!! They had changed my policy to ANNUAL instead of quarterly; talk about freaking out! I called the company and they changed it back…WHEW! When the lovely young girl who was assisting me on the phone asked: “Is there anything else we can do for you today, Pamela?” I said: “Help me pay this $974?”…she just chuckled….sigh. Along with more health-related issues is my experience at the drug store when purchasing Sudafed tablets. The pharmacist asked for my driver’s license; I assured her I’m 61, old enough to not be ‘carded’…she chuckled (are you seeing a similarity here yet?…chuckling young ladies…sigh). Turns out that the reason I had to not only hand over my driver’s license but also sign on the dotted line saying I was only purchasing this one packet of 24 tablets was because our government tracks all purchases to make sure I’m not stock-piling it to make crystal meth! I told the pharmacist: “Sure, it’s what I do in my spare time!”…(not). I guess it’s necessary; they wouldn’t have those precautions unless it became necessary in the past…sigh. Third ‘health-related’ situation: went to get my eyes tested for new glasses the other day, as my current ones are really bothering me: headaches, slight dizziness, trouble seeing clearly at far distances. Upon examining my eyes my doctor told me that I’m one of the few who are blessed with what’s called: “Second Sight”. I’d never heard of that before (and, NO, I’m not suddenly becoming psychic!). It’s a phenomenon where, as you age your eye ‘lens’ becomes harder; in some people it also can flatten out (my case) thereby causing your distance vision to become better! The reason I was having trouble with my glasses is because I now need less prescription, my glasses were too strong! Amazing! I guess, sometimes, getting older can be a good thing, eh? (at least in this situation) … grin. Ah, the strange changes we experience while getting older…stiffer joints, lessening endurance, etc. but still I’m ‘plugging along’ and looking forward to each new day (call me an ‘optimist’…or just a little crazy, whichever works for you!). Today it’s chilly (41) but sunny so seeing the bright sunlight makes it another lovely Fall day. I’m enjoying all the sunshine I can (trying to store it up in my memory), knowing that soon we’ll have the grey days of winter upon us. I guess there’s a ‘good side’ to that, too: went to JoAnn Fabrics the other evening and playing on their in-store radio was “Here Comes Santa Claus”, “Frosty the Snowman”, and other Christmasy tunes (one of our local radio stations starts the day after Halloween and goes through New Year playing all the seasonal songs). Yes, I’m one of those “wait until December for Christmas songs” people, but also found myself bopping along to the upbeat music while looking at the button racks. Enjoy your day; I know I’m going to try to! Having made it through Friday the 13th just fine, we’re now into Saturday – here at my house (at least today) it was a day of rest (for the most part). I decided that I wanted to make/knit/crochet a gift for my oldest son’s girlfriend (who is like a Mom to my grandson). Found some really nice soft cream colored yarn that someone had given me and started on a (what I thought would be) scarf. After working the pattern for a good 1 1/2 feet I realized that this was just not going to be enough yarn (had 1 3/4 skeins), so I set out on my trusty computer to try to find this particular color and make. It’s by Red Heart, a very trusted name in yarns…however, it’s something I’ve never seen before: called “Caress”. I searched to my little heart’s content, through several sites which carry Red Heart, sites that carry discontinued yarns, through EBay, and finally ended up writing to Coats & Clark company (makers of Red Heart) to ask just where I could possibly obtain another 1-2 skeins. Proceeded to continue with the knitting and got to almost the end of the first skein when a ‘vision’ hit me! 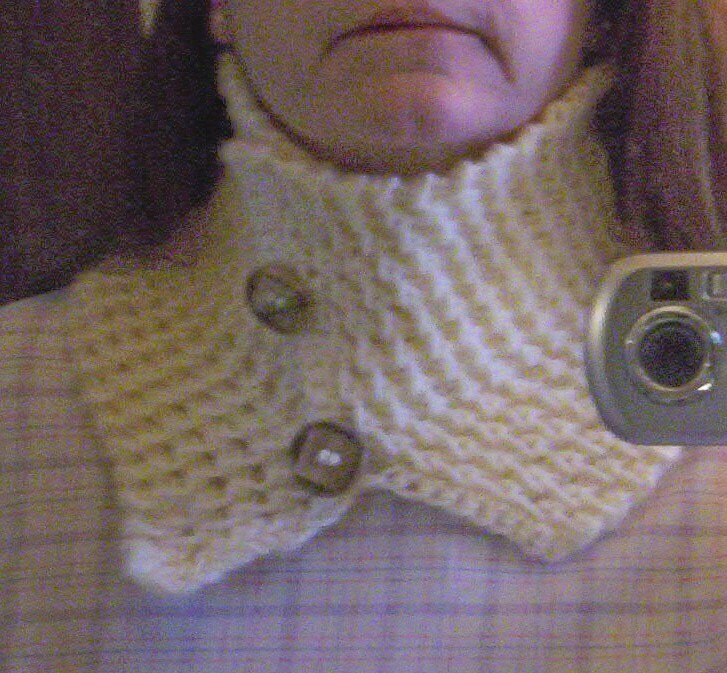 The ladies in my knit group are VERY up on the latest fashions and I’ve heard them talking about knitting these neckwarmers (now called cowls), so I thought: “Let’s see…would this be long/wide enough for that?” Sure enough! I will be posting the finished product soon; am planning on making a crocheted edge and also two crocheted button loops and sewing 2 lovely brown wooden buttons on at the front. Now, mind you…this is not MY style, but it will definitely fit into the ‘in-style’ things being made these days. I’m not even sure if she will like a cowl; last year I knit her a hat and couldn’t really tell from her reaction just what she thought of it (never saw her wear it, either), but I’m of the opinion that I feel like I’d like to give her a gift, and one that’s from my heart, so we’ll see how it goes. I grew up with a very diverse musical background (my mom having been a classical pianist), but Saturday evenings used to be ‘record night’ at our house and how I loved that! We’d drag out all the 78’s (all glass? not your vinyl records of the later years); we’re talking the 40’s & 50’s. Songs like: “Davey Crockett” (my favorite), songs by Jimmy Durante, The Mills Brothers, Ella Fitzgerald, Spike Jones…lots of variety and I loved them all! Anyway, I’ve said all that to eventually get to the fact that I can’t seem to hear about, or cook pork chops without thinking of that song! Last night I did something I haven’t done in a very long time: watched a ‘chick flick’ all by myself! Youngest wasn’t feeling well and went to bed early, middle son was out with his friends, husband was happily playing World of Warcraft on his computer so I decided to check out “On Demand” on our cable (under Free Movies, of course!). That brought me to an ‘oldie but goodie’: Tom Hanks/Meg Ryan: “Sleepless in Seattle”. I had seen the ending before, but never the whole movie; great Kleenex movie, for sure, but just what I needed…a good chick flick! Took me awhile to figure out how to manipulate the cable controller, though…I wanted to go back and replay a small bit I’d missed…that was interesting…it kept going forward! Finally figured it out and the rest was history. Sometimes a girl just has to have her ‘girlie’ fix, ya know? Almost 3 1/2 years old! Today worked out to be one of those ‘not planned, but totally fun’ days. I got most of the housework/chores out of the way yesterday which left me ‘free’. Around 10 a.m. I got a frantic call from our oldest who wanted to know what I was doing right then; “Not much” I replied. “Can you watch the little guy?” “Yes, of course!” Due to some sort of mix-up in scheduling, his Mother had to work, the great-grandmother wasn’t home which left my son frantically trying to find someone to watch my grandson (apparently he’d already driven to the Mom’s house AND the great grandmas…no one home either place!). We had a good time putting puzzles together, playing cars & trucks, rocking (and a nap), then time to go to great grandma’s house. The whole mix-up got straightened out, and I got to spend some ‘fun’ time with my sweet grandson who’s growing so quickly. Due to lots of unplanned events (car troubles/sick cat/his Mom’s changed work schedule) I haven’t babysat him in almost 2 months, other than seeing him for a few hours when his Dad stops by, so this was truly a treat for me. What a nice way to spend a Fall day! Working on afghan #210; managed to ‘put together for sewing’ six more afghans (I usually only get 4 done before getting too tired), so now I’m getting my ‘second wind’ in the afghan department. Last night was my Knit/Crochet group night and we had another new lady join us: total of 17 people gathered to knit/crochet/chat/eat & drink great stuff from Panera Bread/chat lots more/share ideas & patterns…all-in-all, a totally fun evening! (Usually we average around 11-12 on an evening, so it felt like we were bursting at the seams! So glad that the management there like having us…of course we spend money, but they’re very tollerant of us re-arranging all their tables, too…we put them back when we’re done!). It seems we’re still getting a bit of Indian Summer: nice breezes, beautiful colors, sun shining and the temperatures are really nice for this time of year (50-60’s!). I know it will very quickly change, but for now I’m just enjoying the blessings! Have to get off here and go make dinner; my husband’s all-time favorite: “Souper Meat & Potato Pie” (I’m pretty sure it’s somewhere in my postings…it was an old Campbell’s Soup label recipe from the 70’s). It’s basically a big meatloaf which is baked half-way, then frosted with mashed potatoes and topped with shredded cheddar cheese…Yum! Today was one I’ve been waiting for, now, for about a month; took our cat to the vet’s for another check up and he’s doing good! The vet’s report: “Looks like the food is doing him good!” They checked him out and reported that there was no obstruction and very few crystals, so I was just thrilled! So thrilled, in fact, that I went on a mini-shopping spree! (Actually, it was more of a “treat Pammie” spree). Came home with three nice pairs of earrings (Big Lots: they were a set and very reasonable: $3.00), a new container for my knitting supplies in my ‘carry everywhere’ knitting bag (for scissors, tiny ruler, crochet hook) from the St. Vincent de Paul thrift shop (for $1) and my last little find: Almond Chocolate Biscotti on sale for $3 at our local drug store! Yep, I’m a ‘cheap treats’ person, but it made me happy, so all’s good! Finished another afghan yesterday, #209, and am ‘on to bigger and better things’…(actually, just #210….grin). Tonight’s dinner is homemade chicken noodle soup which I have to get making very soon, as I like to let the chicken get to the ‘fall off the bone’ stage before using it in the soup. Was able to obtain a really (in my humble opinion) fantastic, yummy treat recipe and thought I’d share it with you. WARNING: It’s very rich, but VERY yummy! Mix together powdered sugar and graham cracker crumbs. Add peanut butter and melted butter; mix well. Press into a 9 X 13 baking pan. Pour melted chocolate chips over top and spread around to cover top. Refrigate 15 minutes or so (NOT until hard), then cut into small squares. My youngest came home from a youth outing, brought one of these home and shared it with me. Of course I IMMEDIATELY wanted the recipe … it was gooey (could have been because it was in his hot hands? ), peanut buttery, and nicely chocolatey! I have another recipe similar to this one, but that one comes out about 1/4 inch thick; the above recipe comes out about 3/4 inches thick! Believe me…it’s worth making them (forget the calories…they all fall off when you cut the squares! …. wink). Going into this weekend I have a bridal shower tomorrow at church for two of our choir members who are also friends of ours (well…the groom has been like another one of my ‘kids’), so it ought to be a fun adventure! They’re planning a January wedding (Brrrrrrr!). Before I go to the shower I have to help youngest bake a pan of brownies, as he’s attending a Chili CookOff and the teens are required to make (or at least ‘help’ make a dessert…he chose brownies, as that’s HIS favorite dessert!). It’s shaping up like a fun weekend; our weather’s been a bit ‘goofy’ but I’m happy…it’s been chilly (in the 30’s & 40’s) with some rain, some gloomy days, BUT….NO SNOW so far! (It was predicted that we were supposed to get ‘scattered flurries’ Weds & part of Thurs, but they didn’t appear…YAY!!!). Enjoy your weekend; stay warm, eat something YOU like (brownies/biscotti/bagel?) along with a nice, hot steaming cup of your favorite beverage….gotta stay cosy, remember? The leaves around here are now mostly on the ground; the weather has taken a decidedly chilly turn, with grey days filled with light winds and rain. That’s OK, it’s what’s supposed to happen right around now. Halloween, for us, was un-eventful; we live on a main road (45 mph speeds) so we don’t get trick-or-treaters, haven’t for many, many years. The Harvest Party last week for my special needs group went very well; we had a roomfull of people (students/caregivers/parents) who seemed to really enjoy themselves. We went through a ton of chips & hot cheese, cider/pop and cookies. We had so much donated candy that each student went home with two small bags full! It was a busy, fun evening, for sure! In large bowl, combine cabbage, apple, carrot, bell pepper and onions. In small bowl mix together mayonnaise, brown sugar and lemon juice. Pour dressing over salad and toss. Refrigerate for 1 hour and serve chilled. Note: You could also add chopped pecans, raisins, poppy seeds or mandarine orange segments. It’s been kind of ‘touch & go’ lately with our cat; another trip to the vets Friday for a re-check found that his urinary tract was blocked again (for the third time). I called my husband to ask just how to proceed. He said go ahead with another catheterization, but this is the last time. I fully understand; it’s been almost a month of vet checks and he isn’t really getting ‘over the hump’. As I’ve said before, we can’t afford the major surgery for him if he blocks up again. It’s a hard call to make, but sometimes you just have to do the ‘hard things’. We’re just watching and waiting at this point, hoping that somehow his system will finally clear itself. Other than that, it’s been rather calm around here; finished afghan #208 Saturday and now working on 209. Visited the chiropractor today and my back is staying stable, which is a great thing-I’m not in pain. I’ve learned that, whether I like it or not, these visits are in my future regularly for me to maintain mobility and flexibility. Yep, I’m gettin’ older…sigh.